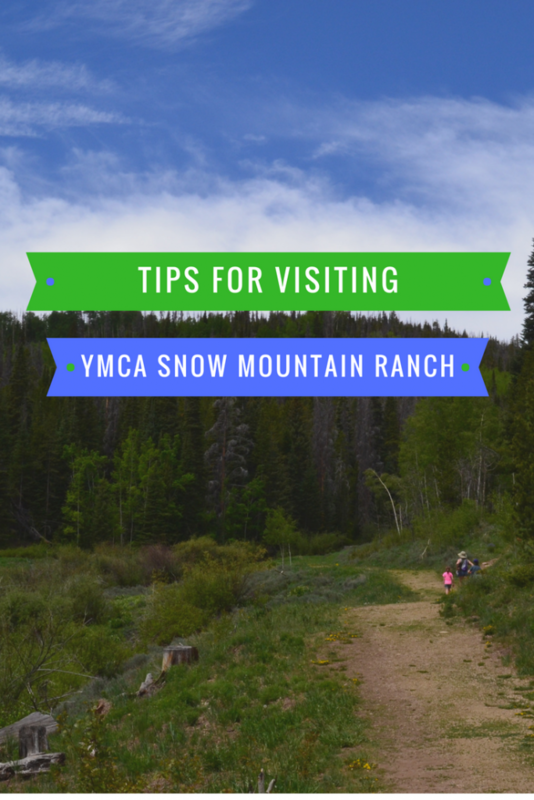 My family had the opportunity to visit the YMCA Snow Mountain Ranch, near Granby, early this summer. This is the second time we’ve been and the kids were begging to go back. We arrived on a Wednesday afternoon (pro tip: if you can go during the week, you have a better chance of getting the accomodations you want…and the camp is less crowded!). We began unpacking, and the kids set everything up in the yurt where we would be staying. OK, we need a minute here to discuss yurts. I’ve come to the conclusion that they’re my absolute favorite place to stay. The YMCA has some beautiful lodges – I actually stayed in one last February on a Girl Scout trip, and they’re comfortable and roomy and there’s a huge fireplace in the main lobby that’s so cozy. But in the summertime? Yurts are the way to go. They give you a camping experience without all the actual hassle of camping. No setting up tents and securing food from bears. No leaks when it rains. But you still get the experience of being so close to the outdoors. You can have a campfire. You can even cook at your site if you wish (if you don’t, the Y also has a cafeteria with meal plans, as well as The Buckboard Grill which serves really good pizza, sandwiches, and grill food.) Below is a tour of our yurt in case you’d like a better idea of what to expect. After we were settled in, we headed to the dining hall for dinner. We then discovered that while the Kiva Room will be open all summer for roller skating and basketball, it was actually closed this week for maintenance. No big deal – instead we checked out the new playground next to the summer tubing hill. I’ve never seen anything like it. It had a zipline the kids were clamoring to ride, and the coolest teeter-totter ever. Yep. Even the big kids were having a blast. We stayed at the park until the sun went down, then headed back to the yurt, tired but excited for the next day. After breakfast in the morning, we headed out for some ziplining. Of course after that, we were definitely ready for some lunch! Then, we headed out for the one thing I’m really glad we made time for. We haven’t ever been horseback riding at the YMCA before. 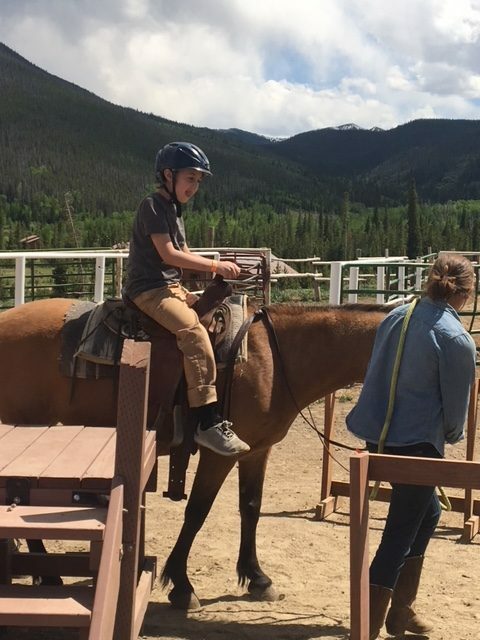 I figured there was enough other stuff for the kids to do, we didn’t need to worry about booking horseback rides as well. But this year we decided to go for it, and I’m so glad we did! 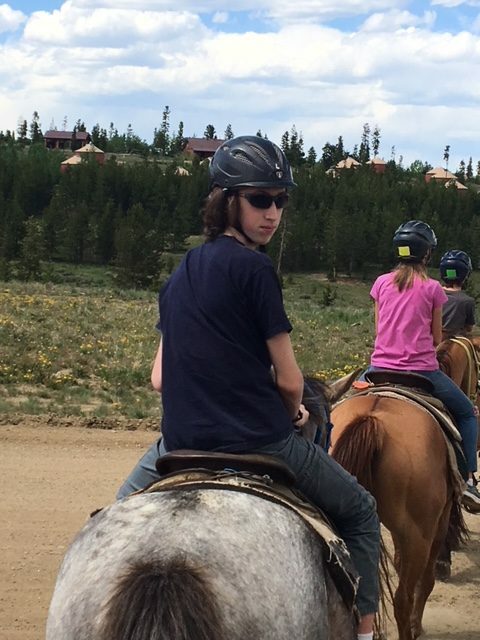 Only one of our four kids had been on a horse, and they all loved it. Even my unexcitable teen talked about the ride afterward and told me we should go more often. Sometimes, it’s worth the splurge for an unforgettable family experience, and this was definitely one of those times. It doesn’t hurt that we were riding through some breathtaking scenery in the Rockies, either. The kids and my husband ended the afternoon at the Arts & Crafts lodge, while I relaxed and read by the yurt…and everyone slept very soundly that night! We wrapped up our trip the next day with a hike to the waterfall. 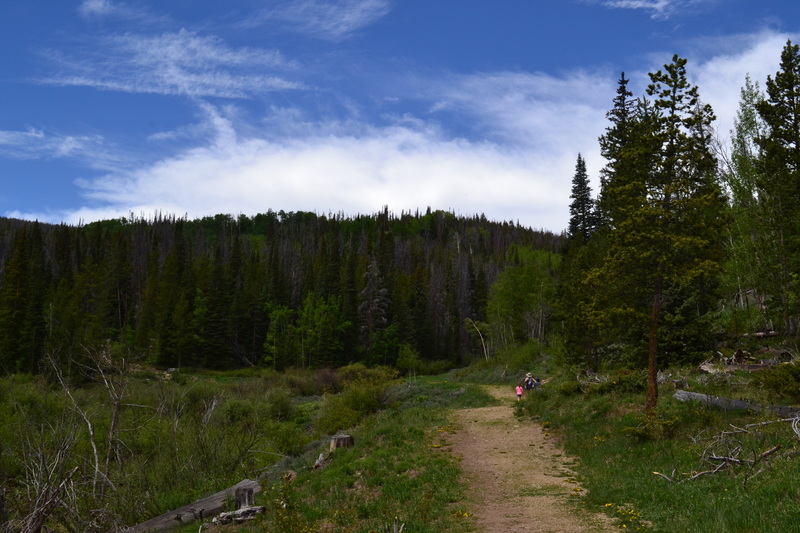 It gets a bit steep in parts, but is definitely doable with kids if you go slow and bring snacks and plenty of water. 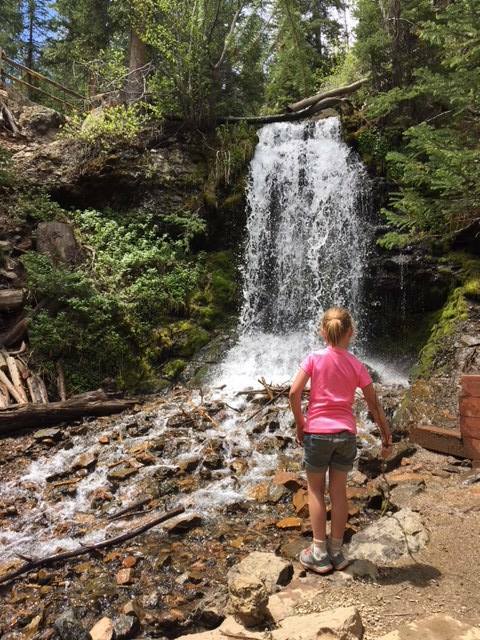 My kids will hike just about anywhere if there’s a promise of food. After celebratory pizza at The Buckboard Grill (we earned it! ), we headed down the mountain – tired and happy. 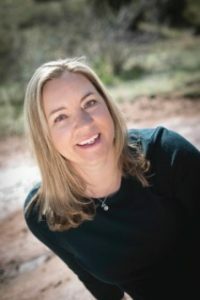 It hits me every year that soon my kids will be out of the house – hopefully visiting during the summer, but not necessarily around as much as they are now. I treasure trips like this, and I hope they remember them for a long, long time (and keep coming back for them even when they no longer have to!). Many of the activities, like summer tubing, roller skating, the waterfall hike, and games and campfires planned by the camp are free. A few things like ziplining cost a nominal amount. If you’re going to do arts & crafts, you do need to purchase your craft, but we found quite a few things to do for around $5. Also, be sure to talk to the arts & crafts workers – some projects need time to be glazed, so make sure yours is going to be finished by the time you leave. 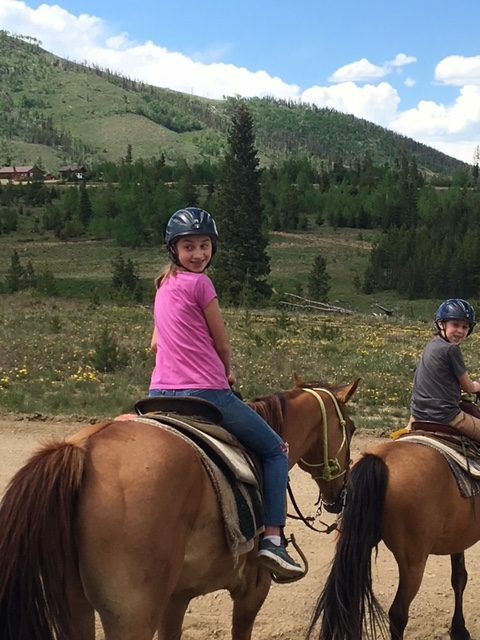 The most expensive activity we did was horseback riding, but as I said above, I think it was worth it for us! As I mentioned above, my favorite place to stay in summer is in the yurts. They come equipped with bunkbeds to sleep 4 and a bed that sleeps 2. They also have a microwave and minifridge. There is a picnic table outside, plus a charcoal grill and firepit. The yurts do have electricity but they do not have heat. Although the camp supplies sheets and blankets, we always bring sleeping bags and extra blankets to keep warm. There are bathrooms and showers a short walk from the yurt so you’ll want shower shoes and a small bag for toiletries. Although checkout is mid-day, you can stay as long as you’d like on your last day. You may want to go for one last round of mini-golf, or keep your swim suits handy for a final dip in the pool before heading home. You can find everything you need to plan your trip here. 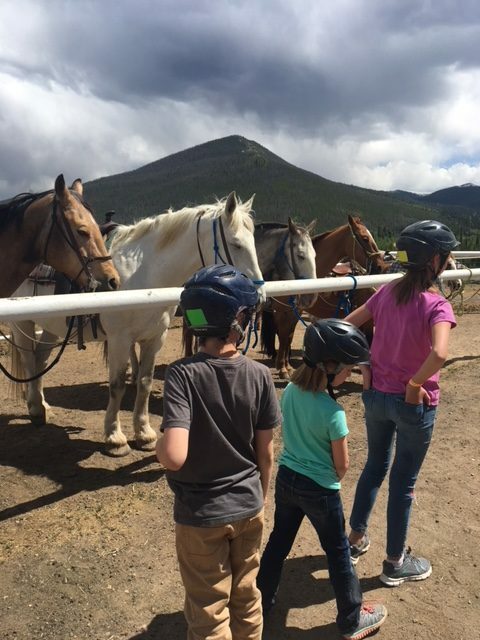 We were given complimentary lodging, meals, and activities at Snow Mountain Ranch. No monetary compensation was made and all thoughts and opinions are mine and are honest.